Guys, its been a minute since I've done this whole blogging thing. A few of you may not even know who I am, or how you got here. So hello! I'm Kim, and I own Allium Floral Designs in Lombard, Illinois. We're a home-based floral design studio specializing in weddings and events in the Western Suburbs of Chicago. 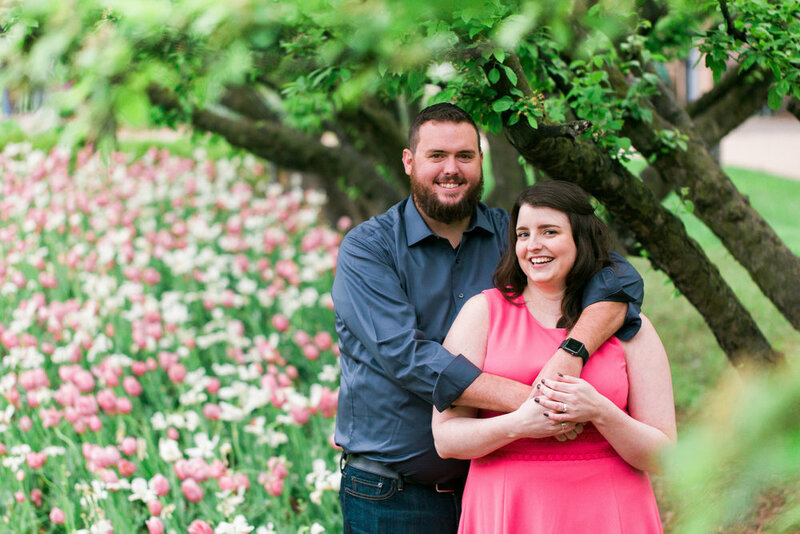 That's me, and my fiancee, Sam -- this lovely shot was taken by Grace Gruwell of True Grace Photography for our engagement session this past May. We're walking down the aisle this September, hence why the business has been a bit MIA. Allium may appear to be dormant, but I promise, its been a calculated, quiet, season intentionally. The goal for 2018 wasn't growth, but to establish one thing: Process. From the start of this business in 2013, I've flown a bit by the seat of my pants. Pulling from my prior experience in another well-known Floral Shop, and my time in retail, I have created a long list of desires & dreams for my business, but had little time while working full-time, to make them a reality. The time for those dreams is now. Slowly, piece by piece, wedding by wedding, I've built a brand that I believe in, and am excited to begin investing both the time, and energy, it deserves. I want to stress that all of my/our collective energy goes into the events we have booked, beyond that, items like the website, and our facebook go to the back-burner. I've embraced our Instagram (follow-us... its a daily shameless plea from me to the world to secure a #dunkindonuts sponsorship) page to keep everyone up to date on the things we are doing to keep this business moving forward. Thanks for coming along on my journey -- more beauty to come in the upcoming months, I hope you'll stay tuned! !